Fed Chief Bernanke To Discuss Sluggish Economy Policymakers at the Federal Reserve wrap up a two-day meeting Wednesday and will explain what they plan to do about interest rates. The consensus seems to be they'll keep short-term rates near zero to help support the lagging economy. Federal Reserve Chairman Ben Bernanke has issued cautions about the economy. Policymakers at the Federal Reserve wrap up a two-day meeting Wednesday and will explain what they plan to do about interest rates. The consensus seems to be they'll keep short-term rates near zero to help support the lagging economy. While policy may remain unchanged, there will likely be a spirited discussion over whether the Fed should change course. 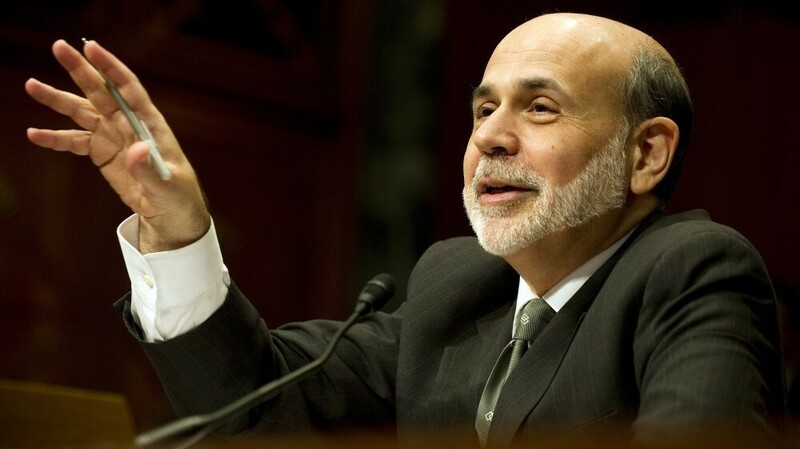 And there could be some details released about the give and take around the table, because Federal Reserve Chairman Ben Bernanke will hold a news conference after the meeting. The news conferences happen four times a year and coincide with updates of the Fed's economic forecasts. Like most observers, Randall Kroszner, a former Fed governor, now a professor at the University of Chicago, thinks Fed policymakers will stand pat on interest rates. The Federal Reserve has kept the federal funds rate, which serves as the basis for most other types of interest rates, near zero since the end of 2008. "At this point, I think the Fed is going to stick with that long-term commitment to keep interest rates low. There really hasn't been enough information to come in since the last meeting to suggest any change," Kroszner says. The most important piece of data was a disappointing employment report at the beginning of April showing only 120,000 jobs were added to the U.S. economy in March — half the number added in January and February. Kroszner says that report vindicated Bernanke's cautions about the economy when others were declaring victory early in the year. "His caution is well-warranted. We didn't want to start popping the champagne corks after just a few months of good data in the job market because that's what a number o people did be back in 2010, were very disappointed, did it again in 2011 and were very disappointed," Kroszner says. Since the jobs report, the economy has offered mixed messages. Stronger than expected retail sales, but flagging consumer confidence. On Tuesday, there were some signs that the housing market may have bottomed out, with a report on an increase in new homes sales in the past couple of months. But John Tuccillo, a former economist with the National Association of Realtors and now chief economist at Florida Real Estate, says it all depends on jobs. "If we don't see strong job growth, then we're not going to have a real estate market that comes back sooner rather than later. So it's extremely important," Tuccillo says. Still, Kroszner says it's unclear where the job market and the economy are headed. "I don't see recession on the horizon, but I don't see breakout growth coming, either. And I think given the mixed data that's out there, reasonable people can disagree," he says. So Kroszner says there will be a rich discussion around the Open Market Committee table, but no change in policy.